This herb has enjoyed a long history in the medicinal industry, but is now so sought-after that it is nearly extinct in the wild. Key constituentsVolatile oils (pulegone, menthone, diosphenol), sulfure compounds, flavonoids (diosmin, rutin), terpenes (limonene), mucilage. The buchu plant is of South African origin and is now cultivated in Africa and parts of South America. Buchu has been known for its medicinal value in South Africa for centuries, being commonly used by the Khoekhoe tribes in order to relieve stomach complaints in particular. However, the herb has earned a place in modern medicine, due to its healing properties and industrial applications. Treating infections. The antiseptic, antimicrobial properties of buchu are useful for the treatment of kidney and urinary tract infections, as well as for gynecological problems related to yeast infections. Relieving pain and inflammation. Buchu helps reduce the pain and swelling cause by inflammatory diseases, such as arthritis and rheumatism. Additionally, buchu is also popular for speeding up wound healing and treating minor digestive disturbances. However, it should be noted that these are all traditional uses of the plant, and no scientific data backing up these claims has yet been published. The main compounds behind buchu's health benefits are its volatile oils (pulegone, menthone, diosphenol), sulfure compounds, flavonoids (diosmin, rutin), terpenes (limonene), and mucilage. The volatile oils of buchu plant, limonene, and maercaptro-p-menthan-3-one (a sulfur derived from pulgone), are not only responsible for the characteristic minty smell and flavor of the buchu leaves, but also possess diuretic and antimicrobial properties, which are believe to help in the treatment of urinary and kidney infections, as well as with gynecological problems, such as cystitis, leukorrhea, and yeast infections, like the ones produced by Candida albicans. Diosmin is a bioflavonoid that have been successfully used in pharmacological products for the treatment of pain and bleeding hemorroids, as well as inflammation in chronic venous disease. Limonene, as well as being beneficial for health, is also part of the reason that the essential oil is used in the perfume industry. Minor sulfur-containing compounds are responsible for the characteristic blackcurrant smell and flavor. The combined action of mucilages and flavonoids in buchu are thought to be responsible for its antioxidant, anti-inflamatory properties, owing to its effectiveness at reducing gastric damage. 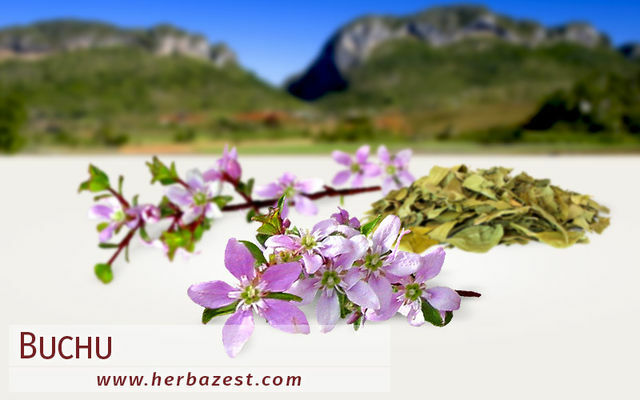 Maize, uva ursi, and marsh mallow also possess antimicrobial and diuretic properties, whereas peony and witch hazel have anti-inflammatory benefits. Buchu is considered mostly safe. However, the diosmin contained in the herb can cause nausea, stomach discomfort, and somnolesce in rare cases. Although the oil from short buchu has a variety of health benefits, care must be taken not to consume oil from the oval leaf buchu, as this has compound cocktails that are potentially toxic and provide little in the way of medicinal benefit. Buchu should be avoided by pregnant women, as it contains pulegone, a compound with strong abortifacient effects. Although it is not used much as a culinary ingredient per se, the buchu leaf and buchu oil are important flavor components in herbal teas and in food products. However, in order to reap its medicinal benefits, buchu is best consumed in herbal preparations. Infusion. Made from the dried leaves, buchu tea is the most popular way to consume the plant in order to relieve mainly stomach complains. Tincture. A more traditional use that is still prevalent in South Africa today is to macerate the buchu leaves in brandy and drink it as a stomachic and stimulant tonic. Capsules. This form of consumption is convenient for specific treatments, since buchu capsules contain high amounts of active compounds, available in daily fixed doses, and help treating pain and inflammation, as well as urinary tract infections. Although there are many different presentations of buchu available, it is important to seek for providers who keep sustainable harvesting and production practices because of the vulnerable status of the plant. Buchu seeds can be purchased from certain online retailers, and buchu teabags are available from specialized health stores and ethnic markets. Buchu oil can be purchased online, as well as buchu supplements, which usually come in capsule form, and are marketed as a way to support gastrointestinal and urinary tract health. Buchu grows in dry, mountainous regions of South Africa and parts of South America. This fragrant, aromatic shrub requires specific conditions in order to thrive outside of its natural environment. Buchu can be grown from seeds, but they are not commonly found, and the plants are unlikely to grow in colder climates. Another way to grow buchu is from cuttings, which must be planted in late summer, preferable as a part of a hillside garden. In order to be successful, buchu cultivation must occur in well-drained, coarse soil. The buchu plants require plenty of direct sunlight and a frost-free environment. The leaves are harvested during the summer, when the shrub is blooming or fruiting. The buchu shrub can grow up to 6.5 feet (2.0 m) tall and bears small, rounded leaves, which are glossy and have serrate edges. The buchu flowers are also small and shaped like stars, normally being white or pale purple in color. Buchu (Agathosma betulina) is member of the Rutaceae family, which comprises more than 900 species across 150 genera, mostly found in tropical and subtropical regions, mainly in Australia and South Africa. Well-known members of the also called citrus family are kumquat (Fortunella spp.) lemon (Citrus limon), grapefruit (Citrus x paradisi), and rue (Ruta graveolens). The genus Agathosma is composed by only three species: A. betulina (buchu), A. crenulata (oval leaf buchu), and A. serratofolia (long leaf buchu). While the first two species of buchu can be safely used medicinally, special attention should be given to the potentially toxic A. crenulata, which is very similar in appearance, although the leaves are more than twice as long as they are broad. The modern history of buchu starts in the 17th century, when it started being used medicinally in South Africa by Dutch settlers, and then by British settlers about 200 years later. Buchu leaves were first exported to Britain in 1790 and by 1821 the plant became so popular that was included in the British Pharmacopeia as an effective medicine for "cystitis, urethritis, nephritis, and catarrh of the bladder." In North America, buchu emerged as an important medicine in 1847, when it was patented by Henry Helmbold. Unfortunately, this marked the beginning of the rapid decline of wild buchu in its native South Africa. The buchu market centers mainly on its medicinal value. The commercial success of this native South African species since the 19th century has unfortunately contributed to the decline of wild shrubs. The remaining natural plants are mainly restricted to the Western Cape Province and protected by the Agricultural Research Council of South Africa, which initiated a project designed to save it from extinction and create jobs. Buchu is one of only three South African plants to be used in international medicine. Perfume industry. Buchu oil contains a compound called limonene, which is responsible for its strong and pleasant aroma, and it is used as a base for many fragrances. Food industry. The peppermint-like flavor of the buchu leaves is used in the fabrication of teas, candy, and liquor, among many other products. USDA Plants Database, Agathosma betulina (Bergius) Pill. buchu ; Classification for Kingdom Plantae Down to Genus Agathosma Willd.